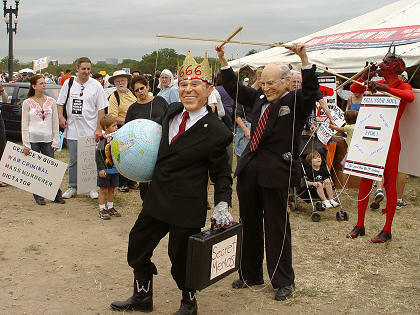 These three people were dressed as Bush, Cheney, and the Devil. Bush is being controlled like a puppet by Cheney, but Cheney is being controlled like a puppet by the Devil. Bush's briefcase says "Secret Memos", and the Devil's sandwich-board sign says "Sell Your Soul, 2-For-1 Special Offer, Offer good thru the 21st century". 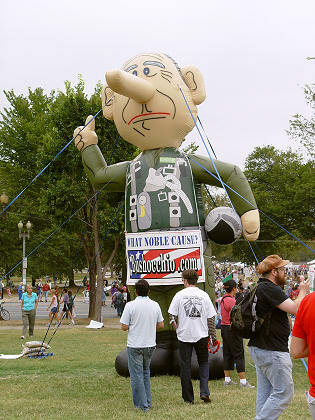 A giant-size Bush dressed in his "Mission Accomplished" flying suit, but with a looooong nose like Pinocchio from telling a lie. There is a sign stuck on his back saying "Impeach Me". These are produced by Bushocchio.com. Fake money from a 9-11 conspiracy group deceptiondollar.com. Click on the money to see the reverse (use your brower's "back" command to return). 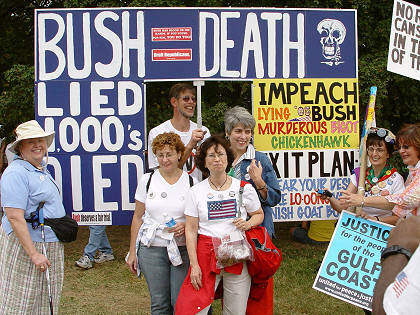 Some protesters posing with their signs. 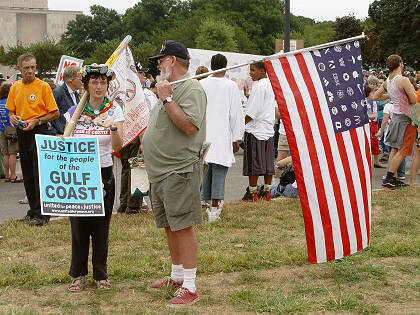 The woman in front with the flag on her shirt had a very determined look on her face—she clearly meant business. This man was wearing the most unique and unusual costume of the day. 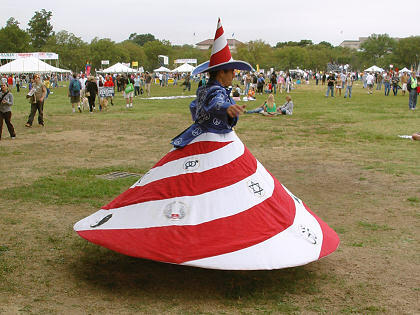 It looked like a red, white, and blue witches costume when he stood still, but as he started spinning round and round, the skirt flared out into a full conical shape that spiraled like a pinwheel. Three cheers for his imagination and creativity! Two protesters before the march. The flag's stars are actually corporate logos.